Buying new tires should be an easy task. Just roll into your tire shop of choice, let the experts do their thing, and drive away with confidence. Unfortunately, it doesn’t always go so smoothly. There have been many cases of shops installing the wrong type of tire. The lesson? Don’t leave all of the decision making to the professionals. Educate yourself, instead. Here’s a handful of important things you should know when your buying new tires. Know when it’s time to replace your tires. Tires are replaced for many reasons. Could be climate related as in getting prepared for the snow season. Age of a tire where the structural integrity of a tire is compromised. It could also mean a tire has reached its end of life due to wear. One of the key indicators of an end of life tire is the tire’s tread depth. In most states, tires become legally unsafe when they’re worn down to 2/32” of remaining tread. One of the easiest ways to check this measurement is to visually inspect the tire tread wear indicator bar that is part of the tire itself. See diagram. Tread wear indicators are molded into the tire. 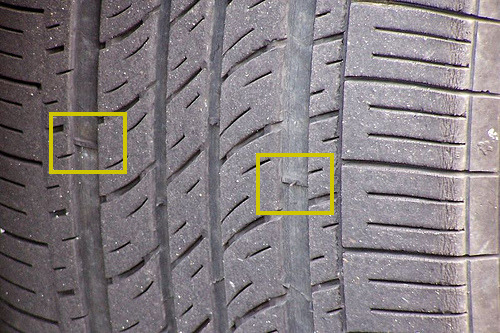 When the tread wear indicator is visibly flush next to other treads, the tire tread depth is unsafe and tires need to be replaced. Know your tire size. Most people aren’t aware that installing the wrong tire size can be both damaging to your car and outright dangerous. Tires that are too tall for your car can cause their edges to rub against your struts or wheel wells. If you go too small, you can create stability problems on the road. Always buy the tire size that’s specified in your owner’s manual. There’s usually a bit of wiggle room, such as going slightly wider or slightly taller. This should also be specified in your manual. Never allow anyone to install tires that aren’t manufacturer recommended, and never mix tire sizes if you’re not buying a full set of four. Examine your driving habits. Most sporty cars require tires that are rated for speed. The tires themselves are manufactured differently, offering a bit more “flex” in the sidewall to accommodate higher performance and better grip. Check the recommended speed rating of your tires against your owner’s manual, but also take into consideration how you drive. Dependent on that, you may be able to get away with installing a tire with a lower speed rating that’s also a lot less expensive. Likewise, consider where you’ll be driving. Choose tires that offer optimum performance in rain and snow if you live in an area that receives both. Check the tire warranty. This is one of the most important things to look at because it can directly impact how soon you’ll have to replace your tires again. Tires come with a range of mileage warranties that run the gamut between 30,000 and 100,000 miles. Higher performance tires usually wear out more quickly, and in some cases don’t even come with mileage warranties. Tire shops also frequently offer road hazard warranties to cover you in case of a blowout or an unrepairable flat. Before you buy, make sure the shop offers a road hazard warranty. Last but not least, always go with a reputable shop to do your tire installation. To review the satisfaction ratings of auto mechanics near you and to schedule an appointment online, pay a visit to Openbay. Compare pricing and book service from quality local shops with the click of a button. This entry was posted in Maintenance Tips, Repair Services and tagged auto maintenance, auto repair, automotive, automotive service provider, buying new tires, new tires, openbay, tire maintenance, tires. Bookmark the permalink.